Globe: $3. Shorts: free. JCrew cardigan: $3. Cork Jar: $2. Birdcage: $3. Plaid vintage suitcase: $5. Sock monkey: $1. Deer puppet:$1 Croquet mallets: $4. thrift store finds are so much better than something you bought at a department store. nothing beats finding a perfect pair of vintage shoes for $2. 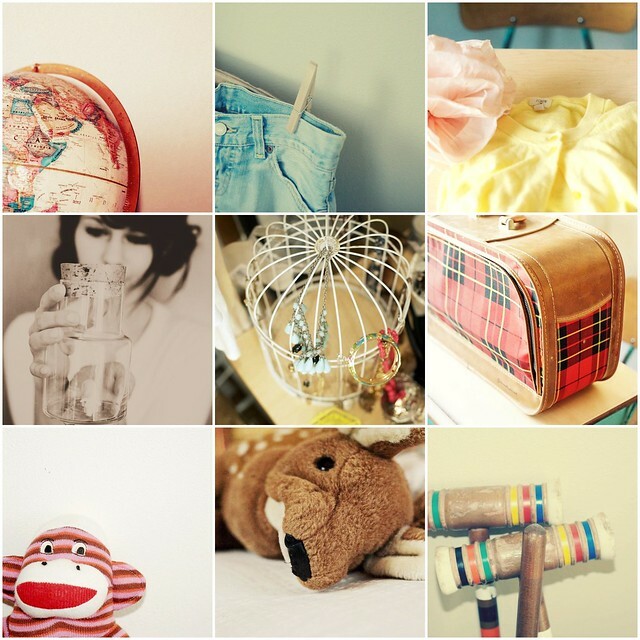 Your finds are lovely, and your photos are even lovelier! Brittany: Thanks, girl. And I totally agree. Nothin' like a good deal on something lovely. Amanda: Thanks dear -- and I love your thrifting post. What good finds...those dresses are seriously cute. Piril: Good luck! Find lots of spring things : ] I'm on the lookout for a long, tiered 70's-ish floral skirt. My latest goal! Anything in particular you're hoping to find? you take such pretty photos :) and all those purchases are wonderful! What great finds! The pictures you took of them are so pretty, too.